As I mentioned in a previous post, we’ve recently launched OU Create at the University of Oklahoma which affords students free domain and is powered by the good folks at Reclaim Hosting. Intro to Mass Communications, the introductory course out of the OU Gaylord College of Journalism and Mass Communication, is a course using create.ou.edu to build websites where students can reflect on the course (which has been wonderfully redesigned this s by David Tarpenning). This semester, among several digital initiative integrations, are multiple guest lectures from industry and the first was Mike Boettcher, an award winning (two emmys!) journalist and war correspondent and visiting professor at the University of Oklahoma. Their assignment was to break up into teams of two and do a video interview reacting to his lecture that was then added to their blog. They also wrote a blog post reacting to diversity in mass media. 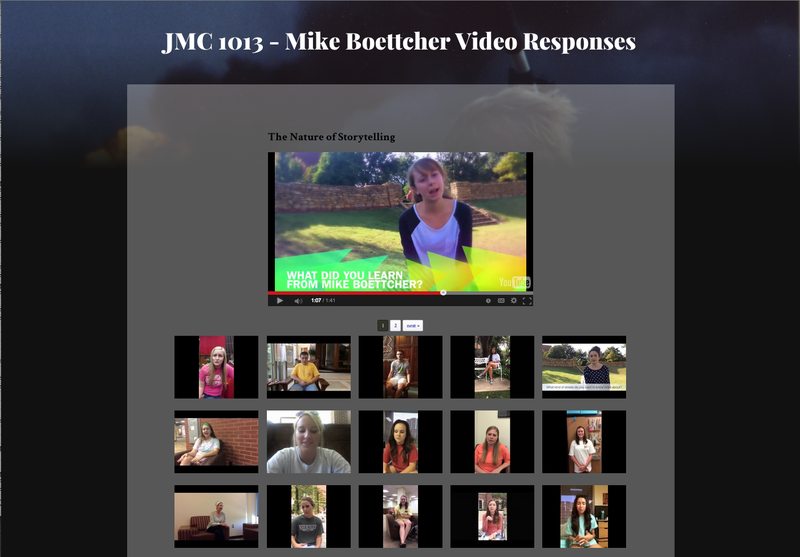 We created a hub where students can now view all of the videos from their classmates: http://jmc1013.dtarpenning.com/mikeboettcher/. To do this, we used a WordPress plugin called TubePress which will pull in feeds from YouTube or Vimeo (channels, playlists, searches, users favorites, etc.). We created a playlist for all the Mike Boettcher reaction videos so that playlist is now being automatically pulled into the website. As of this post, there are almost 100 videos that top 2.5 hours of students talking about the lecture. For the students, this special moment in time… the first guest lecture many have ever seen has now been personally documented by the STUDENT and it is something they can refer to for years into their journalism program and beyond. Imagine being a journalist well into your career and being able to look back and see how you originally reflected on that first journalist you ever met who is talking about how he was literally putting his life in danger daily in Iraq and Afghanistan. If you watch some of these, you soon notice the inner struggle that students have with understanding the places one might go to capture a story and they debate on whether they would do that themselves. It’s some unreal stuff! For the student, there’s power in both in the individualized space and the centralized hub. In their own blog, they own it. It’s not a paper that gets submitted through a learning management system for one person’s eyes to ever see. It’s exposed to the world. The centralized space allows them to see that distributed conversation in a “flow” persay. It lets them judge their work across their peers and push each others creativity. For an instructor to do this, you are tell the students that their voice actually has value in the larger conversation of the boundaries of journalism. We’re making creativity scalable as well as personally valuable (you, yourself, just have to have to see the beauty of both). The good news is you can 🙂 Check out all the student’s blog posts for the course here over on create.ou.edu.